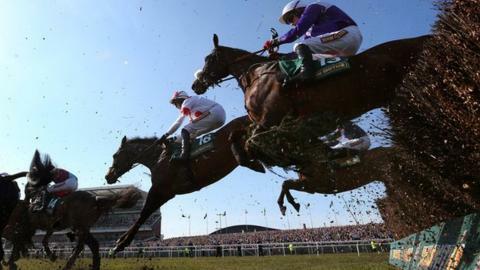 The field has been finalised for Saturday's Grand National at Aintree, with a maximum of 40 runners set to line up in the famous steeplechase. Lost Glory was the only withdrawal on Thursday, allowing Swing Bill a run. Tidal Bay, trained by Paul Nicholls, heads the weights as the 13-year-old seeks to become the oldest winner for more than 90 years. Contenders include 2011 Cheltenham Gold Cup winner Long Run and Monbeg Dude, winner of the Welsh National in 2013. Swing Bill, trained by David Pipe, was sixth last year and is owned by Judy Halewood, the boss of race sponsors Crabbie's. Last year's third-placed horse Teaforthree is the current 8-1 favourite ahead of 12-1 shot Monbeg Dude, who is part-owned by former England rugby union captain Mike Tindall, team-mate James Simpson-Daniel and Welsh fly-half Nicky Robinson. Tindall's wife Zara, a leading equestrian rider, supervised schooling sessions last year to help the horse, trained by Michael Scudamore. There had been 65 entries remaining for the race, which is run over 30 fences and nearly four and a half miles, with the lowest-rated horses balloted out. The 2013 winner, Auroras Encore, has been retired and runner-up Cappa Bleu is injured. Long Run, the Nicky Henderson-trained dual King George VI Chase winner, is the mount of amateur jockey Sam Waley-Cohen. Champion trainer Henderson also has Hennessy Gold Cup winner Triolo D'Alene, Hunt Ball and Shakalakaboomboom as he looks to win the race for the first time. Double Seven has been well backed after 18-time champion jockey AP McCoy was confirmed as rider of the Irish-trained horse. McCoy, who won the big Aintree race on Don't Push It four years ago, picked the eight-year-old ahead of Colbert Station, also owned by JP McManus. Double Seven, who was 25-1 earlier in the week, is already down to as low as 12-1. The horse is trained by Martin Brassil, who triumphed with Numbersixvalverde in 2006. The National, which has a record prize fund of £1m this year, is a handicap chase run over nearly four and a half miles, with different weights given to runners based on previous form. Sam Twiston-Davies, 21, will ride Tidal Bay as the 13-year-old - carrying top weight of 11st 10lb - bids to become the race's oldest winner since Sergeant Murphy in 1923. Trainer Nicholls, triumphant with Neptune Collonges in 2012, is also likely to run Hennessy second Rocky Creek and Welsh National runner-up Hawkes Point. Officials hope there will be no serious injuries after all runners came home safely in 2013, when a more flexible fence structure was introduced following two equine fatalities in each of the previous two runnings.